One summer’s day in early August, 50 swimmers made a splash into the Atlantic Ocean to begin their strokes across the Northumberland Strait from Cape Jourimain, New Brunswick to Borden-Carleton, Prince Edward Island. Amongst those 50 dedicated swimmers participating in The Big Swim was Tanya Muggeridge (Class of ’99 and ‘03), Facility Manager for the Genomics Unit at Dalhousie University, Faculty of Agriculture. Completing the grueling 14 kilometre swim was something Tanya has had her sights on for the past three years. In 2017, Tanya and her fellow swimmers faced a similar fate. Standing on the beach both mentally and physically prepared, bad weather descended and dampened the spirits of those prepared to swim. The entire swim was cancelled due to high winds, thunder and lightening. To the delight of this year’s swimmers though, 2018 was much different. The Big Swim is an annual summer event that raises money for the Brigadoon Children’s Camp Society as part of the Give to Live project. Currently in its eighth year, The Big Swim has recently reached the $1 million mark in fundraising money. Each year, up to 50 swimmers can register for the event and pledge to fundraise to support the charity. For Tanya, it was a challenge she couldn’t pass up. Born in Ontario, Tanya and her family moved to Newfoundland. She stayed there until the age of 14 when they moved back to Ontario. For Tanya though, the East Coast had captured her heart. She returned to Newfoundland to attend Memorial University where she met her husband, Mike. Together, they made the move to Truro, Nova Scotia where they have been living for 25 years. 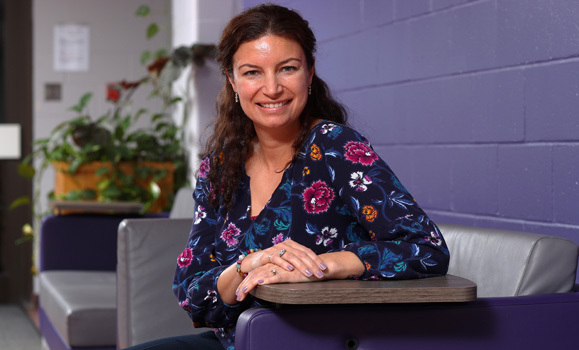 Tanya graduated from Dalhousie University, Faculty of Agriculture (then Nova Scotia Agricultural College) in 1999 with a Bachelor of Science degree in animal science. She then returned to complete her Master’s degree in 2003. Today, Tanya manages the Genomics Unit at Dal AC and facilitates the research of faculty across campus. On top of her work at Dal AC, Tanya has a seven-year-old daughter who she explains was part of her motivation to complete The Big Swim. 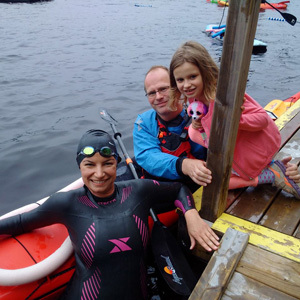 “It was important to me to show Maya that I wouldn’t give up; I would complete and achieve my goal of swimming across the strait and she would be there on the other side to witness it,” Tanya says. While it was important to Tanya to complete the feat for her own child, Tanya was also swimming for the hundreds of kids who attend Brigadoon Village each year. Located in Aylesford, NS, Brigadoon Village is a traditional sleep-away children’s camp where children battling chronic illness can be ordinary and experience camp like any other child. It provides them with a very important break from the institutional healthcare system that they spend so much of their time in throughout the rest of the year. Beginning her training in March, Tanya would visit the pool at Truro’s Rath Eastlink Community Centre to swim laps. She began increasing her swimming distance from 1 km to 5 km. As the weather improved, she trained in lakes throughout Nova Scotia and in the ocean when the water warmed up, swimming up to 9 kilometres. After countless hours of rigorous training, Tanya swam 18 km across the Northumberland Strait in eight hours. It took a bit longer than anticipated as the undertow and current pushed most of the swimmers many kilometres away from the Confederation Bridge. For Tanya, this was the most difficult part but her razor-sharp focus kept her going, one stroke at a time. While Tanya’s mental fitness certainly played a role in getting her safely to the other side, she also credits her motivation to her husband who was, quite literally, with her every stroke of the way. “All swimmers are required to have a kayaker alongside them. My husband, Mike, was my kayaker. Mike was my rock and was extremely supportive throughout our eight hour day on the water. I would not have been able to complete it without him by my side. In addition to his encouragement and company he also had our food and drink on the boat; definitely a necessity for spending the day on the water” she adds with a smile. Tanya’s seven-year-old daughter and other family members were waiting for her on the other side during her crossing. It was knowing that her biggest supporters were waiting for her that kept her motivated and determined. Looking back, Tanya is thankful for the experience. In total, $170,000 was raised in support of Brigadoon Village. She now joins the other 199 people who can say they successfully swam across the Northumberland Strait. While she is forever grateful for the experience, Tanya admits she won’t be participating in The Big Swim again. She explains she is considering her next charity challenge and is excited to see what she’ll find herself training for next. “I have reached my goal of successfully swimming across the Strait,” she says. “They only take 50 swimmers each year so it’s time to hang up my wetsuit and let someone else take the plunge. In the future, I may consider running across the Confederation Bridge rather than swimming under it!